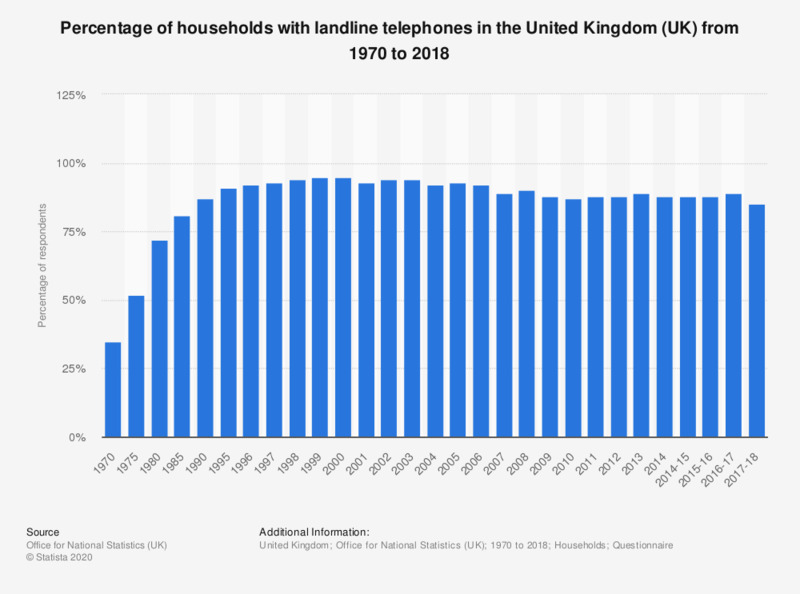 The statistic shows the percent of households in the United Kingdom (UK) that own a landline telephone. In 1970, when this survey initiated, 35 percent of households owned a telephone. As of 2018, that number had increased significantly to 85 percent of households. The market penetration was at it's highest in the years 1998-2000 when it reach 95 percent. It's important to note that this statistic refers only to land line phones. It does not include mobile phones. Although fixed-line telephony has been losing customers since around 1998, its remaining customers seem to be pretty satisfied with the overall service. Most consumers are now making telephone calls in their homes using mobile phones instead of telephones. This is also reflected in the mobile telephony penetration. The convenience of mobile and smartphones seems to be winning over especially younger generations.